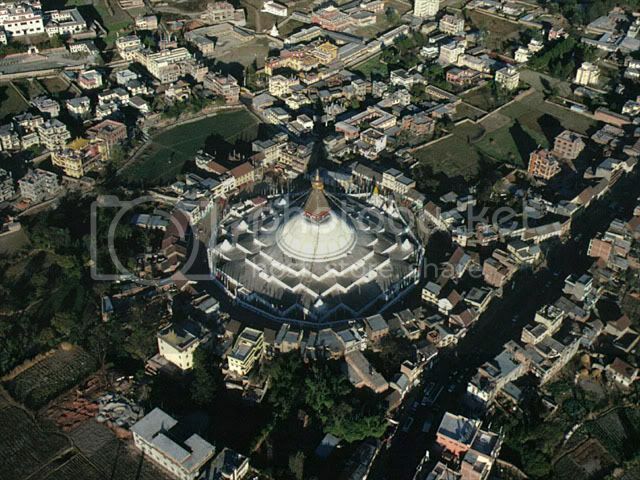 This is holy BoudhaNath Stupa from aerial view. It's just magnificient experience to be at this place. I feel lucky i'm born to this area. I know the story of BoudhaNath Stupa and i'm going to tell you. But precisely,someone had already put the content systematically on net. Hope you find it interesting. Several aeons ago, a Goddess had a daughter called GANGCHUNGMA, an emanation born from the mind of Arya Avalokitesvara. She descended to the human land and was born to DECHOG, the daughter of a male servant in the town of MAGUTARA in Nepal. She was a professional poultry keeper and gave birth to four children, fathered by the men of four lower castes: first a son of a horse keeper, then a son of a pig keeper, followed by the son of a dog keeper and at last a son of a poultry keeper. They all grew well by the wages she earned out of poultry keeping. She continued to amass her remaining wages and became very wealthy. To extract the essence of her multiplying fortune, she thought of erecting a huge Stupa having the relics of the Tathagatas as a receptacle of Buddha's mind, her meditation deity, and a field of immeasurable beings accumulating merit. Armed with this, one day she approached the King, described the story in detail, and asked him to provide her with land. "How wonderful it is for a lady poultry keeper to think of erecting a huge Stupa from amassing her remaining wages". The King answered, "Can Erect, Erect." The mother including her four sons, a servant, an elephant and a donkey began to carry bricks. Having laid the foundation, they laid bricks up to the height of three chairs. Jealously, the inhabitants of the town approached the King, objecting about the lady poultry keeper building the Stupa. "What type of Stupa would you and your rich Ministers build from your root virtues," they questioned the King. "You should disallow the construction, or otherwise it will be destructive to us all." The king thought "How wonderful it is that a lone lady poultry keeper, nurturing four children from four different fathers, is willing to build a great stupa from the wages of her work". The King said to his people: "Because the women’s thought is a wonderful thought, the words ‘can erect’ slipped out of my mouth." So the building of the Stupa began. Other peoples also opposed against the building of the Stupa, but its construction continued undaunted. Ever since the Stupa was known as "Can erect slipped out of mouth." Not long after, having erected the Stupa to the vase level, realizing the closeness of her death, Ganchungma, the mother, requested her four sons and servant to complete the great Stupa, in honor of her meditational deity and the field to accumulate the highest of merit by all sentient beings. She, then, placed relics of Tathagatas inside the Stupa and held an extensive consecrational prayer over it. Having said this, by the benefit and reward of great Stupa's construction, she attained full enlightenment of a Buddha. To repay back the kindness of her root virtue (accruement of merit), the vase was completed after three more years of hard labour. Inside the life tree, they installed the relics of Buddha Kasyapa, which amounted to a Magadha measure. Abundant substance of offering was arranged. While they began tossing flowers for it to dwell forever, Tathagata Kasyapa with the attendants, as well as innumerable Buddhas and Bodhisattavas of the ten directions appeared in the front sky. The ten directions are north, south, east, west, northeast, northwest, southeast, southwest, everything above and everything beneath us. Buddha’s are believed to be in every molecule of dust. To express the presence of Buddha in everything, it’s told the Buddha’s are in the "ten directions". At present there are about 2.200.000 Buddha’s. The earth tremored three times, when these great beings tossed flowers and petitioned extensively for the endowment of all Goddess. Splendid signs like the radiation of rays of light occurred. Host of the Tathagatas, Innumerable Buddha's and Boddhisattvas expressed unanimously "Hey, listen the children of good and fortunate family. As the benefit and reward of erecting so great a Stupa with pure intention, the supreme receptacle of the Dharma body indifferent from the victors (Buddha's) mind - whatever you pray for will be answered". First, the horse keeper's son prayed: "By the benefit and reward of erecting the Stupa's vase with pure and high intention, may I take birth as a great Dharma King propagating the precious teachings of Lord Buddha at a degenerated era in the future, in the snowy land, when Tathagata Shakyamuni's doctrine disseminate". The pig keeper's son prayed: "May I take birth as a pure Bhikku, an officiating Abbot, to confer novice vows to the Sangha when my brother is born as a great Dharma King propagating the Doctrine". The dog keeper's son prayed: "When one of my brothers disseminates the Buddha's teaching and the other maintains it; unlike birth from womb, may I take a miraculous birth from Lotus flower and discontinue the cycle of my birth and death; my life span to become equal to the sun and moon, then take birth as one of the powerful but humble beings among the Gods, Demons and Humans, and make my mission to tame all the vicious beings of the borderland. Moreover, may I fulfill the wishes of my two brothers and become a powerful Tantric practitioner, a Guardian of Buddha's doctrine". The poultry keeper's son prayed: "When one of my brothers spreads the doctrine of Buddha, one holds on to it and one protects it, is no certainty that they will be born at the same place and time, may I at that time take birth as a messenger-Minister creating an atmosphere for them to meet and see each other". Then the Buddha’s and Boddhisvatta’s unanimously expressed, "It’s good that all of you fortunate sons have prayed extensively. Above all, the Buddha’s of the ten directions rejoice at it and they can't even measure the amount of these merits". All the Buddha’s and Boddhisattvas of the ten directions then transformed into a heap of light rays and dissolved into the great Stupa. During that period, the Stupa was also popularly known as "The Stupa of Buddhas' gathering". A bee stung the horse keeper's son, but the bee died while the horse keeper’s son tried to remove it, without doing it any harm. Generating inconceivable compassion he prayed, "When I take birth as a Dharma King in a snowy land, may she take birth as my child and become a Dharma practitioner". A Donkey thought, "How nice it would be if he had prayed for me but he didn't". Angry at it, the donkey uttered, "May I take birth as a minister in a court which dislikes the Dharma, when he takes birth as a Dharma King. He will have no power over me". Upon hearing this, the servant prayed, "May I take birth as a scholarly minister and destroy the potentiality of the crafty, demonic minister." An elephant thought: "Although I have carried huge quantity of stones they don't pray for me. Therefore, may I, the elephant take birth as his brother or his brother's son and suppress the doctrine established by them". On hearing this, a crow prayed: "May I take birth as a Great Boddhisattva and assassinate the demonic King when he begins to destroy the Doctrine." All the prayers were answered. As the horse keeper's son prayed to take birth as a King, he was born as the King THRISONG DEUTSEN. The pig keeper's son was born as the great Abbot Boddhisattva. The dog keeper's son became the great ACHARYA PADMASAMBHAVA; the poultry keeper's son became Wami Thresher of Yarlung; the bee became the Princess Lhacham Padmasel; the donkey became the demonic minister MAZHANG THROM, the servant became Dharma Acharya Padma Gungtsen, the elephant became King Langdarma, and the crow became Boddhisttava Lhalung Pelgyi Dorje. It's such a beautiful place. Seems like a different place from Kathmandu. It's got a wonderful story behind it as well, so once again, thanks for teaching something new! hehe. The dog keeper's son prayed: "When one of my brothers disseminates the Buddha's teaching and the other maintains it; unlike birth from womb, may I take a miraculous birth from Lotus flower and discontinue the cycle of my birth and death; my life span to become equal to the sun and moon, then take birth as one of the powerful but humble beings among the Gods, Demons and Humans, and make my mission to tame all the vicious beings of the borderland. Moreover, may I fulfill the wishes of my two brothers and become a powerful Tantric practitioner, a Guardian of Buddha's doctrine". Padmasambabha, also know as,Guru Rinpoche, vicious against demonic powers, kind to all sentient beings, he is my lord. If i pray, it's him. Ohm ah huh vajra guru,peme sete hum.. Jai Guru Rinpoche.!! !